Now that we've managed to display one square a lot of the work is done, we just have to find a good way to use that code a few thousand times based on some kind of level information. We'll also be adding in collision meshes for blocks exposed to air. We'll start off by taking the code we wrote yesterday and splitting it up into more manageable chunks. First of all the end of the code in our last part is used to update the mesh component of the game object. This will be separated into its own function so that we can run it once the entire mesh is planned. Now in addition, put all the new* lines in their own function with parameters for the position and texture. We'll be making some changes to the code then using it to call for every square we want to generate with unique positions textures assigned to them. To make this code work on a larger scale we'll have to make some changes. Because we are using lists opposed to arrays there's a lot less work because we're using the .Add() command to add a lot of the info which appends to the end of the list but the triangles list refers to specific indexes in the vertices array which means that while the first 6 entries might be 0,1,3,1,2,3 after we get to the 150th square it might have to be something like 1000,1001,1003,1001,1002,1003. To address this we'll add a new variable to the script, "squareCount". This will be an int that keeps track of which square we're on so how much we have to add to the ints we send to the triangles. Then we change the new GenSquare function to use this variable. What we do is add (squareCount*4) to each number we .Add() to newTriangles. This needs to be done because the numbers we add to newTriangles are referring to the newVerticies we added 2 lines up. Earlier we didn't need this because with only one set of 4 vertices we knew exactly which vertices to point to in newTriangles but now that we're planning on adding several squares we need each time we call this function for for the numbers added to newTriangles to be incremented by new number for newVertices added each time. To make squareCount accurately show how many squares in we are we also need to add a squareCount++; to the bottom of the function. Also replace all the references to tStone with texture. 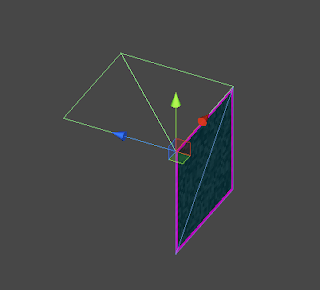 Now when we call the function we'll call it with the desired texture as a parameter that will be used for that square. Also go ahead and reset the squareCount at the end of the UpdateMesh function we made earlier with squareCount=0; so that the next time we generate the mesh the count starts at 0 and add in clear commands for all our lists so that we can start again without adding on top of existing data. Now let's start making more squares. We're going to make a 2d array to store block information so add a 2d byte array called blocks to the script. A byte array is an easy choice for level information. It supports numbers 0-255 so that's a lot of blocks and it saves us the hassle of using enumerators. What we'll do is have 0 be air, 1 is rock and 2 is grassand that should be enough for now. 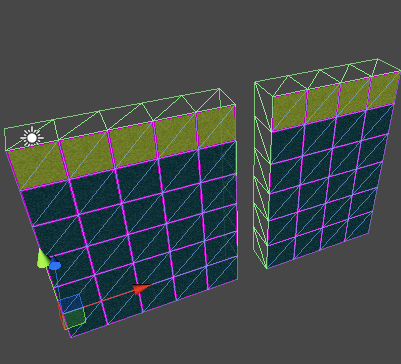 We'll need a way to build this array into something other than blank space so create a function called GenTerrain. In the next part we'll do some basic perlin noise operations for generating terrain but for now we'll do half air half rock. This makes blocks a 10x10 array then goes through each block making any block with a y less that 5 into rock and the row at 5 into grass. Now we need to make a function that will read our block array and build blocks based on it. We'll make another function called BuildMesh to do this. Now this function really just runs through every block in the array and if the byte is 1 it creates runs the GenSquare function using the array index as the position and stone as the texture and if the byte is 2 it does the same with a grass texture. Might need to add some proper textures soon. You can also make the array bigger or smaller or mess with the GenTerrain function to get some cool effects. Now I also promised collision meshes in this part. Collision meshes are really exactly the same as the meshes we made so far just without the textures. They also can't face the camera like the block textures do, they'll have to face up, left, right and down. We can't just go and add collision meshes to every block in the scene though because most of these are surrounded by other blocks, if there's no way to get to a block there's no need to spend time making it solid. We'll start just making the colliders and think about how to implement them later. For testing you'll want to make your block array into a 1x1 array. Also make new variables colVertices and colTriangles, a new int colCount and a MeshCollider. And the UpdateMesh() function will need a few additions, firstly we make a temporary mesh to apply the collision mesh data to and then we apply it to the collision mesh. Then like with the other lists we need to clear the collision lists and reset the counter. We're now going to make squares just like before except that these will face up, left, right and down to make the squares we've drawn already be solid. You can probably guess what the code is going to look like. We'll be using colVertices and colTriangles instead of newVertices and newTriangles and we won't by using UVs because a collision model doesn't need a texture but otherwise these squares are made in the same way as our textures square. Your scene view should show this when run now. One face with an upward facing collider behind it. So that code was just defining the points of the square and then creating the triangle data. The colCount is the same as the squareCount was to the last mesh code we did. Now I'll lay out the code for the other sides, there's really not much to learn in what numbers the vertices should be using; for me at least it's mostly a lot of trial and error, scribbling on paper and trying to visualize the four points' coordinates to figure out where each mesh should have its vertices. As long as you understand that each colVertices is a coordinate in 3d space that a corner of the cube uses and that the side that's facing you when you put down the triangle coordinates clockwise will be the solid one you've got it. You should see this; all four colliders. 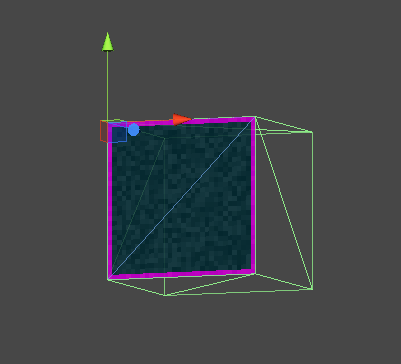 Now, we have a working square with colliders. if you were to extend the size of the array for more squares however, you would run into an efficiency problem because every solid square is creating eight triangles. That's a lot more than we need so we need a way to only make these colliders when they face an empty block. For that we'll need a function to check the contents of a block. This is a simple function that checks if the block you're checking is within the array's boundaries, if not it returns 1 (Solid rock) otherwise it returns the block's value. This means that we can use this places where we're not sure that the block we're checking is within the level size. We'll use this in the collider function. Now when you run it you should get a much more efficient collision mesh, go ahead and switch the array size back to 10 by 10. Colliders only along the top where the blocks are exposed to air. If you want you can do the same to the block visuals as with the colliders and not render (Or render a different texture for) blocks that aren't exposed to air in order to hide ores and things. I'll let you figure that out. That concludes part two, as always if there are any problems please leave a comment as soon as possible and I'll fix it. I'm open for any feedback. Feel free to follow me on twitter (@STV_Alex) or G+ to get updated when I post part three. Next time we'll be using perlin noise to make more interesting terrain, caves and ores and adding functions to build/destroy blocks based on mouse clicks or collisions with the blocks (Like when a character hits a block with a hammer for example). Thanks for these great tutorials. Two error to report so far. But in your paste the last line is missing a semi-colon. I'm fortunately not copying and pasting (because I think that invalidates the point of a tutorial, I think.) I just managed to spot it. Do you prefer "error reports" being posted here? Or is there somewhere better? Thanks Wolli, I've fixed what you pointed out. It's very helpful to have people who can manage problems like this and then let me know so I can make it easier for others. I think it's best to have these kinds of error reports in the comments, I fix the problems as soon as I can but someone else might stumble across the same thing before then and it's nice for them to be able to find a solution. Dude this is awesome, step by step. . . Thank you so much. This guide has been very helpful, i'm new to Unity and game programming in general and have been able to keep up so far with your guide. Awsome, im learning heaps thanks. Having lower case Vector giving an error: "The type or namespace name `vector2' could not be found. Are you missing a using directive or an assembly reference?" Meaning the Mesh is null, right? But I still have something wierd going on. The block on the top right corner is not generated for me. This I just cannot wrap my head around.. Any help? I am at the part where I should first see the intial grid picture but I can not see it... If i put the original Start code back in it shows the single square. What should all of start look like by that point? The v in vector should be V or it cannot refer to the struct and you should get an error. What the comment says haha. because on the borders of the array there should be a collider. right? You can't collide with something that you can't even get on, it's a check to see if it's out of boundaries. Your GenSquare() method is assuming a "float z = 0;" - perhaps you copied it from a later version with a z param? Of course that's purely a matter of style. I'm having trouble, where we add the public byte thing, I get lost after that bit. so trying to assign newMesh to col.sharedMesh couldn't work as col didn't existed yet. Hey man, tks so much, your tutorials is great. I'm not sure what I'm missing here but only the top collision meshes seem to be rendering. Thinking it was Unity simply wasn't rendering the gizmo for the colliders, I tested it with the built-in character controller. My character can stand on top of the blocks but goes through them from all sides. I've reviewed the code a few times but since I don't want to copy/paste, I don't know what I'm missing. Also, I'm not sure what is supposed to be controlling the array size for how many blocks it's rendering at once. I don't recall it being pointed out in your code. Doing some further sleuthing, I copy and pasted the sample code and got results that more closely matched the last image in the tutorial. 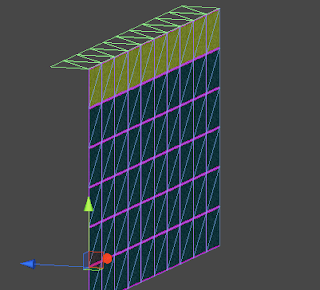 However, while I do seem to get the collision meshes on the insides (between the missing column 5), the front collision meshes are still missing. Is there perhaps some setting I need to change on the Mesh Collider Component of my Game Object? I looked back at the first tutorial and my settings seemed to match verbatim. This is several years too late, but maybe it will help someone in 2017+. The reason why the GenColliders is producing colliders in between the two different sets of blocks in the example image, is that the block in between is literally an "air" block. If you go outside of the byte[x,y] limits, then it's empty space, and won't render colliders. This is why the top of the terrain object has colliders, but the left, right, and bottom edges do not: There are air blocks above the ground, but not outside the array, or below it. Another way of saying it: Colliders only appear if there's a block edge INSIDE the array. Anything outside the limits of the array will not produce a collider. I have a question. Are these supposed to be individual scripts or one long script? You never explained it and the number scale on the left insinuates they're separated. Failed setting triangles. Some indices are referencing out of bounds vertices. Hey man thanks for the tut I think that it would be easier for beginners to understand if you generated the vertices for the collider squares in the same order top -> top right -> bottom right -> bottom left for each one just because it wouldn't be a question to wonder about. Thanks again! I have been following the tutorial, but when I get to the part where a collider is supposed to be visible in game mode, it does not appear. I checked MeshCollider in gizmos. If anyone finds my error, please let me know. I have been stuck for two days now. If I run the game, I can see the textured blocks (in game view). But on scene view nothing shows up. Could it be a problem of Unity 4.5? Ok, stupid thing, solved it. As i'm using a small display, my scene view and game view share the same frame (can't se both at the same time), like by default. OF COURSE nothing will show up in scene view while i'm not in "game mode". 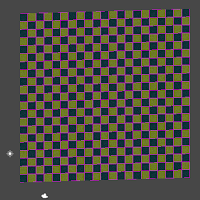 If anyone had the same retarded problem :P just split the frame, make sure you can view both SCENE and GAME. Then you'll see your mesh colliders. I'm having trouble with the part before all the collision stuff. 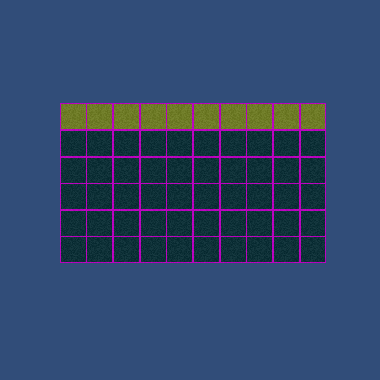 I cannot get the code to render more than 10x6 squares. His initial example image shows 10x6 squares with a byte array of [10,10] (which is odd to me), but then he says we can expand it to generate a larger grid. This still gives a 10x6 grid, instead of 50x50 grid. What's wrong? Nevermind, I just figured it out. The for loop stops at py==5. Changing it to py>=5 fixes it. 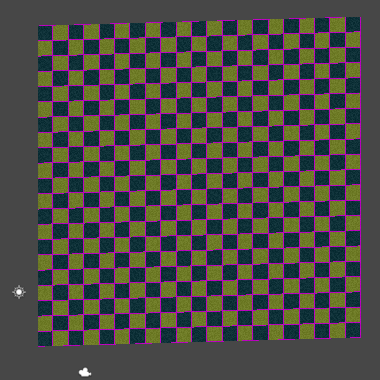 Not sure if I've setup Unity correctly, but when I run this code, why does the first row of tiles start at y==-1? ie, the first tile has vertices at (0,0) (1,0) (1,-1)(0,-1). How can we change this to have the tiles begin generating at y==0? 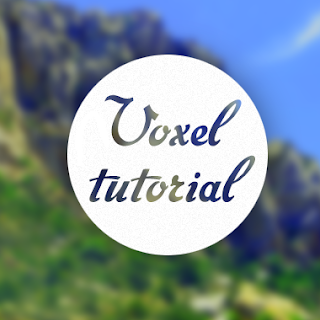 This is an absolutely brilliant tutorial! Well done explaining difficult concepts in such a simple and easy-to-follow way. I'm not following step-by-step, but looking at how you do things to help me implement my own system. Thanks so much! Brilliant work! Hello, this is an awesome tutorial, but just wondering if it is possible to make the curvy shape of perlin sound apply to all 4 corners of the rectangle to make it look more like a spheroid? I got this crazy idea but procedural generation is not my strongest part as I just started learning.